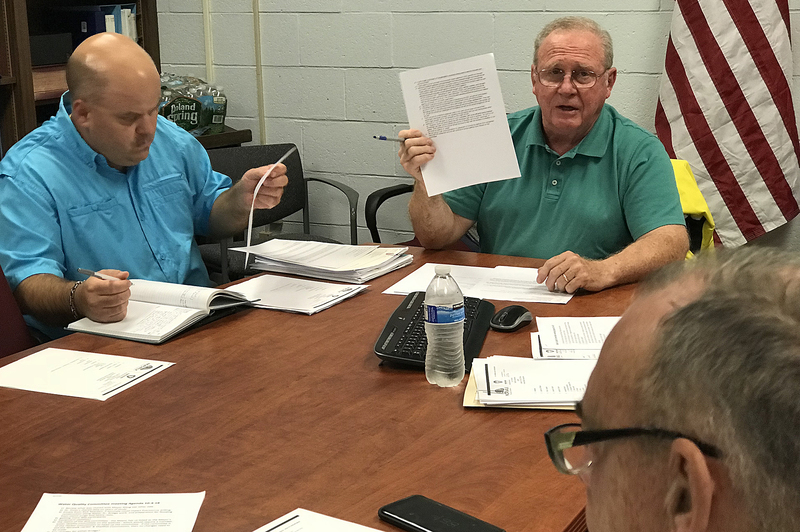 Norwalk Mayor’s Quality Committee Chairman Joe Schnierlein leads the Committee’s Oct. 4 meeting in the Norwalk Health Department. Norwalk, you have a new Mayor’s Water Quality Committee. The long-dormant Committee has been reformulated, with Joe Schnierlein as chairman and four or five other members, all men. Schnierlein is research and university liaison at The Maritime Aquarium, according to his LinkedIn page. The Committee has met twice. At the second meeting on Oct. 4, the group talked about seeking a grant to fund equipment and consultants to monitor water quality during the Walk Bridge reconstruction. John Romano initially suggested $100,000 from Eversource and/or the State would buy equipment, and Schnierlein said $250,000 would fund people in addition to equipment. The State should provide the grants, Romano said. Romano, one of two Harbor Management Commissioner who have been attending, on Oct. 4 said he’d heard from South Norwalk resident Rick Reardon that there’s “heavy duty construction” on Manresa Island, a “hush hush” move to tap into the high voltage transmission line under Long Island Sound so that the people on the other side of the pond will have electricity when their power plants are shut down for maintenance. Continuing conversation concerned the Eversource plan to submerge a power line under the Norwalk River and the importance of microorganisms in the mud flats. Coming up Wednesday is a chance for you to weigh in on a proposal to allow portable toilets in the Industrial 1 zone, at a Zoning Commission public hearing. Zoning Commissioners are not too keen on the idea, Planning and Zoning Director Steven Kleppin said to Planning Commissioners on Sept. 25. The Planning Commission turned down the request to allow portable toilets anywhere in the Zone, so the Zoning Commission would need to approve it with a 2/3 majority. This proposal comes from C&A Portables, a Stamford company looking to move its corporate headquarters to a 3,000-square foot warehouse at 8 Merritt Place, the former home of Premier Wood. Up to 200 porta-potties would be stored at the facility during the winter, with maybe 10 in the summer, Attorney Albert Vasco told the Planning Commission. Issues of concern raised by neighbors include the facility’s close proximity of residences. Premier Wood drove the neighbors crazy, they said, with a hydraulic buzz saw that drew noise complaints and smoke from a wood-burning kiln. No noise, no smell and the porta-potties will be hidden from sight due to the elevation changes, Mike Mushak said, comparing the benign use to the previous use that created “screaming” neighbors. “This is almost the lightest layer of industrial use,” Mushak said. Chairwoman Fran DiMeglio said the antiseptic smell would be terrible, but Vasco said the porta-potties would always be clean and Mushak explained that they are “charged” and cleaned where they are installed. The yard would be used simply to store the porta-potties, Vasco said. Norwalk would like C&A Portables to move here but “there are other industrial areas in the city that are not primarily residential, and this is a residential area,” David Davidson said. The Commission turned down the request for a Zoning amendment, saying the proposal should come in as a site-specific application rather than a zone-wide change. King said she’d like to ask Stamford if C&A has inspired any complaints. Kleppin said he expects Merrit Place neighbors to attend the public hearing in opposition to the request. “I haven’t gotten any emails,” Tom Livingston (D-District E) replied. “Yes, you have,” someone replied. “The nut job over in Westport,” Hempstead said. “Oh, that,” Livingston replied, with multiple other Council members indicating sudden understanding. “Perfect description, everybody got it,” Hempstead said. “Don’t put that in the minutes,” Building and Facilities Manager Alan Lo said. The Westport man’s concern has nothing to do with Norwalk, Lo said. Nick Sacchinelli (D-At Large) commented that it was outside the Council’s purview. “He is not even a resident of the city, it’s a regulatory issue and apparently he has his own issue but I didn’t see that as falling within anything we needed,” said Livingston, Committee Chairman. The citizen could come to the hearing, he said. The “macadamia nut” didn’t show for the recent public hearing. Its a shame none of the councilors didn’t have the ability of reaching out while over the Manressa big wheel meeting to ask Eversource some time in their lab at Manressa. The lab used to process samples taken around the power plant to ensure any contamination found wasn’t theirs. Its a credited lab and with the station not really closed there are people there. The city has has more than one chance to strike a deal , last meetings were for the golf course to the right of the office at the power plant. In that round of meetings Norwalkers spent about ten grand the price of testing for a few weeks. Getting something back would of been nice council members. Porta potties wow we get a half way house with 20 toilets with prisoners and zoning finds a problems with 8 Merritt Place? Where were you guys when we needed you ?